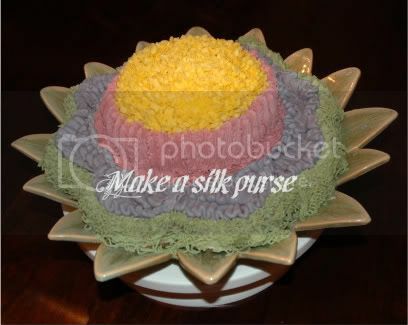 Make a silk purse: It takes the cake! So you've seen the little monkey's birthday gift on this post. Now here's the cake! In more prosperous times I have bought the kiddos cakes (although I made the cake for the turtle's first birthday). I decided I would break out the cake decorating skills this year. Now, this is not a frugal one time option. There is the initial cost of decorating tips, pans, etc. 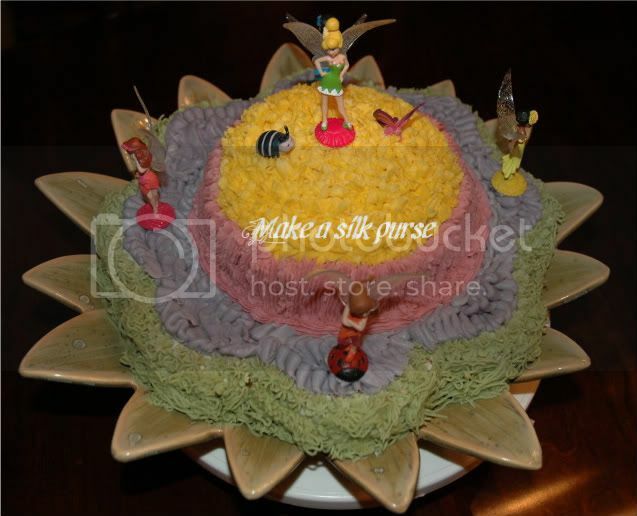 MANY years ago I took a cake decorating class and kept all of my 'stuff'. Of course if you plan on doing this every year then it becomes even more frugal. It was fun to have a little present for the monkey after the cake was eaten! We had about 20 people at the party and almost all the cake was gone! It was fun to make and the kiddos liked seeing me do it. Now if you are looking for someone else to make a cake and you are in upstate South Carolina, please check out Deb Es Cakes. She actually gave me some tips on the icing and it was great! She is donating her proceeds for the month of September to Childhood Cancer Research in memory of her sister.